As our school year comes to a close, I searched our pantry for baking inspiration. It is a dual goal – bake something interesting and use something up that may not weather sitting for three months in a cabinet. Today’s ingredient? Matcha green tea. This is a powdered or finely milled form of shade-grown tea, which is used in Japanese tea ceremonies. It is very flavorful. Increasingly, matcha is finding its way as an ingredient into other food where it adds color and flavor. This is probably not an everyday pantry item. Jack and I greatly enjoy tea. Before we moved up to Alaska, we purchased lots of tea from a favorite shop in California that was (sadly) closing. We had one opened bag of this delicious powder with exactly three teaspoons left… the perfect amount for a cookie recipe! If you would like to try this recipe, we suggest checking with a tea shop that carries Japanese teas. In a medium mixing bowl, cream together butter and confectioner’s sugar. Add eggs and vanilla. Blend thoroughly. Set aside. In a separate bowl, sift together flour and matcha powder. Add in almonds. Mix thoroughly. Add flour mixture to butter mixture. Mix until dough comes together into a ball. Shape dough into a log with about a 2-inch diameter. Wrap in plastic wrap and chill in the refrigerator. Sprinkle granulated or turbinado sugar onto a plate. Roll chilled log in sugar, pressing log into sugar to coat. Using a sharp knife, cut 1/2 slices. Place slices on baking sheet leaving room between cookies for slight spreading. Bake for 12 minutes or until cookies are lightly browned on the edges. Cool on baking sheet for 2 minutes before transferring to a wire cooling rack. Thanks! But be careful about eating too many after dinner… They have a surprising jolt of caffein in them… as we discovered. I’ve never heard of this before. I love green tea. 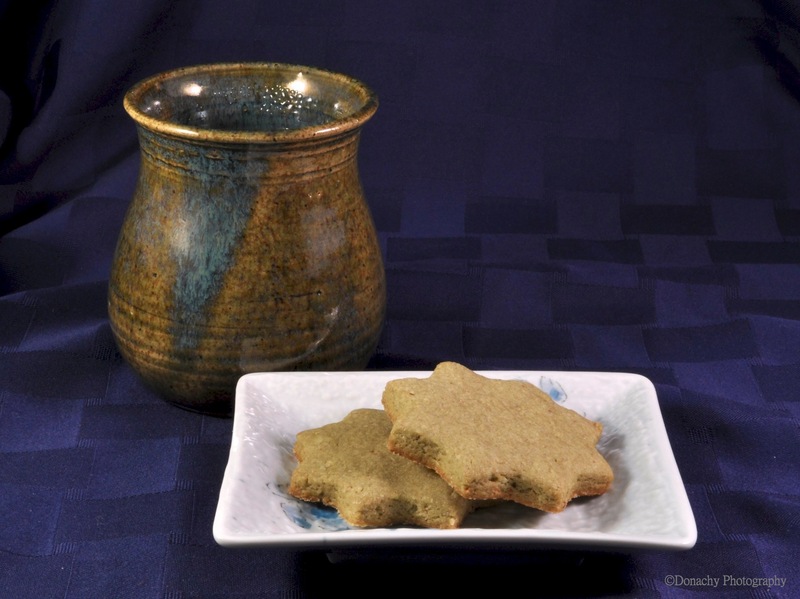 Love this idea of using green tea in cookies, thanks! It’s so good. Give it a try! It sure does look delicious, and a nice photo too! Oh my gosh! I love green tea in desserts. Mochi green tea ice cream! Green tea kasutera cake! Now this?!?! Thank you! Brilliant idea. I am a fan of matcha. Now I have another use for it! Thanks. I love the pottery complimenting the cookies. Thanks for the recipe. We found the cup – and a matching blue one – at the Fireweed Festival in Trapper Creek, Alaska.